There’s something to be said about the nostalgia of 1970’s Manila. Everything seemed to be so easy and laid-back. EDSA traffic was non-existent, shopping malls were new, TV channels were few, and fashion was big and exaggerated. It needs to be remembered however, that as relaxed as the 70’s may seem, the country was also under dictatorial rule, and part of the reason for that ease were the many restrictions that were imposed. ‘Eto Na! Musikal nAPO!’ captures this cultural dichotomy perfectly. Director and writer Robbie Guevara weaves together a light yet heartwarming story that follows a barkada of seven young college kids on their first day back at school. The musically inclined group chance upon a contest calling for original songs. They decide to try their luck, all while navigating their other priorities with family, significant others, and school. All this while living under the unstable political climate of Martial Law. The narrative seems quite simple when laid out that way, but the charm of Musikal nAPO is both rooted in and driven by the actors and the music. The cast brought about a levity and innocence in their portrayal of carefree students. Jobim Javier, son of Danny Javier who is ⅓ of the APO Hiking Society, was quite notable in his portrayal of reformed womanizer Butch. It’s a role that could possibly come across as sleazy and uncomfortable, but instead, he brought so much sincerity and charm into the character. He made it very easy to root for Butch. The same can also be said for Alfritz Blanche who plays Sonny, and Marika Sasaki who plays his girlfriend Jane. They were saccharine but somehow still endearing, and still performed with nuance during the more serious points of the story. Jef Flores who portrays the Am-boy Jaime also displayed outstanding comedic timing. Notable also were the work of set designer Joey Mendoza and lighting director Shakira Villa-Symes for bringing the 70’s to life on stage. Much of the set was kept simple but there were plenty of throwback nods — huge payphones, old wooden benches, and even projected photos of old Manila life. The sepia lighting tone in certain scenes also lends to a very vintage feel. 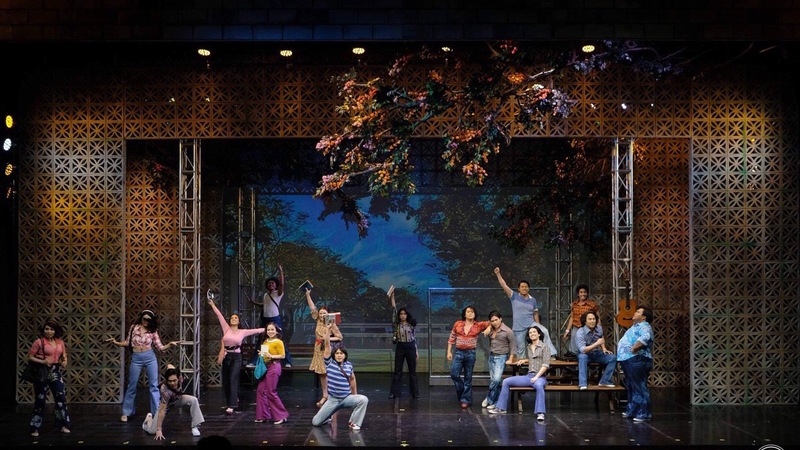 Undoubtedly, the draw to this production is the music of the APO Hiking Society. 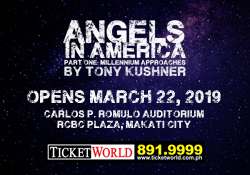 Their songs have spanned decades and generations, and are so well-known to Filipinos. And the concern with jukebox musicals that are based on popular music is that it could easily turn into a mini-concert instead of a play, and the narrative is pushed to secondary status. This is absolutely not the case for Musikal nAPO. Musical director Daniel Bartolome merged the story and the music beautifully, each aspect holding the other one up. Everything made sense. It never felt indulgent in that scenes would be added to accommodate a song, or vice versa. The duet between Rick (Mark Bautista) and Anna (Rita Daniela) of ‘Nakapagtataka’ highlights this merging well. It’s a song that has very specific lyrics, and it’s insertion came at a logical part of the story. Not to sound unromantic, but the fact that this well-known song was performed at a heightened point of the plot and sung almost as a conversation by two leads, actually made it even more meaningful. The story, the music, and the choreography all just flowed together. It’s unsurprising that this original musical is still a hit the second time around. 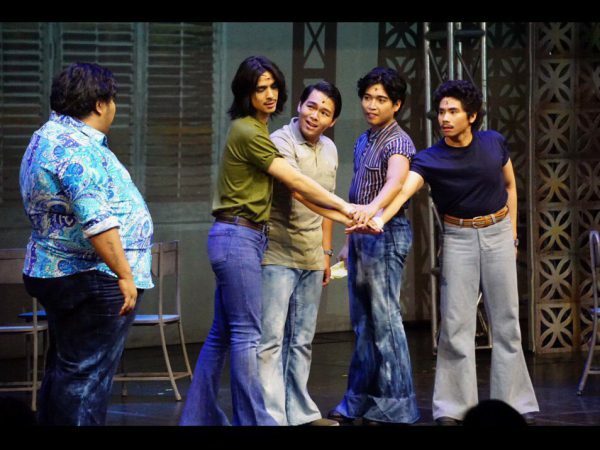 Aside from the technical excellence of the show, it’s underlying themes are so relatable and universal, yet also distinctly local– three descriptions that apply to APO Hiking Society’s music as well. One only needs to look around the theater at the end to see the smiles on the audience’s faces. You can buy tickets to the show HERE.